Is it possible to maintain a clean and organized bedroom all year long? Yes it is! And these bedroom organization tips and strategies will help you organize it and keep it that way. An organized bedroom is possible, and you deserve it. If you follow these bedroom organization tips, you will have the bedroom of your dreams in as little as one week. Yes, you can have a tidy and organized bedroom in one week, it is possible. 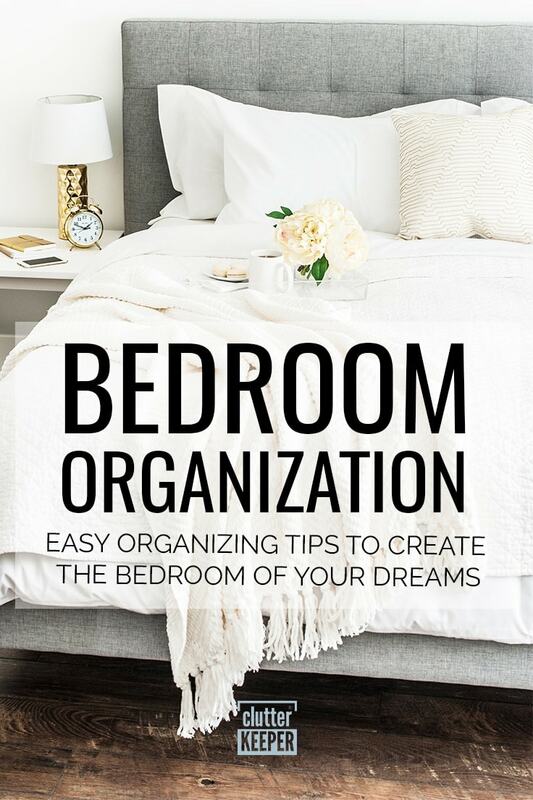 This guide will walk you through the beginning, middle, and end of organizing your bedroom. The result will be a beautiful bedroom that fills your mind with peace – and you’ll have the steps you need to help you maintain it. Before you pick up a single item, you need to answer a few questions. What emotion do you want your room to exude? Where will you store all the stuff you have? 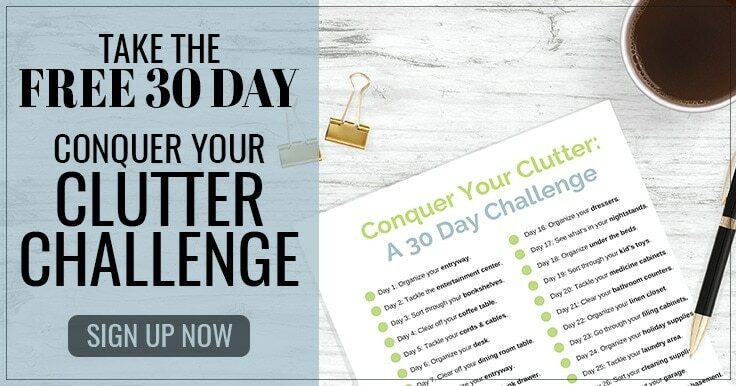 The answers to these questions will power you through the organizing process. Let’s dig into these questions a little deeper. Is it just to clean it up once, or do you want to live in an organized bedroom from now on? If you are a visual person, write your goal down somewhere you’ll see it every day. Then, go after your goal. Make it a reality. As you clean one area (like one side of your closet) step back and bask in your accomplishment and keep going. You’ve got this! What emotion do you want your bedroom to exude? Your bedroom should be a place of peace. A tranquil oasis. You will feel peace and a calm spirit when you look around and see clean countertops and dressers and a floor without things strewn about. Don’t stop organizing and creating new homes for your things until you look around and feel that happy and calm feeling. After you conquer your bedroom organization, you can move onto designing your room with inspiring decor. How you decorate really does affect your mood. Where will you store all the stuff you have in your bedroom? Try this: start by making a list of all the different things for which you need to find storage. Walk around the room and list all the things that are laying about because they don’t have a home. You might discover that some of your things are better stored in a closet or another long-term storage place (like garage or basement). Or you might find that your room is holding things that don’t even belong in there (like your kids’ toys). Then, on another list, write down what type of storage products you need. Do you need more plastic tubs? 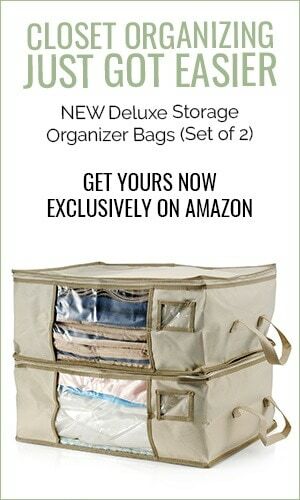 Maybe you need some hanging organizers. Having all this information written down will speed up the actual organization process immensely. After you are fully prepared to organize your bedroom, it’s time to whip the room into shape. 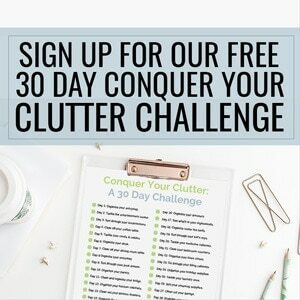 Here on Clutter Keeper, there are a lot of fantastic tutorials and organization ideas. Start small. Organize your drawers first, so you have room to store everything you are going to clean up. Follow your list. Remove the items that don’t belong in your bedroom and give everything that does belong a new home. As you clean up, here are 3 essential bedroom organization hacks that will speed up the process. It seems like things can become lost under the bed, hiding with the dust bunnies. The space between the bed and the floor is such an under-utilized storage space. It is amazing how much stuff you can easily organize within arm’s reach when you use hanging organizers in your closet. Use that space in your closet wisely. If you don’t use it more than once a year, store it in another room. Furniture looks beautiful in a bedroom. It adds depth and personality. If you buy a bench for the foot of your bed, choose one that can double as storage. This is a wonderful place to store extra blankets, letters and letter writing supplies, and anything else that you want in your bedroom but you don’t want out in the open. Finally, it’s important to realize that keeping your bedroom tidy really is possible all year long. After you cleaned up your room and found new homes and places to store your important things, all you need to do is create a plan for keeping it this way. Here are 3 essential tips for how to keep your bedroom organized. Procrastination is the enemy of organization. When you put off picking up things, more things will pile on top. Then you risk falling back into the chaotic state it was before. When you take something out, return it to where it goes, immediately. This one tip will help you maintain a cleaner room. Just organizing it once won’t keep it organized. Once a week (or if your schedule is busy, maybe once a month) go through and re-organize your closet. Evaluate your storage and decide whether you need to move you things to another room or add more storage solutions. After you declare to yourself that you are now going to live in an organized and clean space, you will be less likely to let it fall into disarray again. Another enemy of organization is simply the amount of things you try to store. As soon as your bedroom is organized to your liking, step back and decide how much more stuff your room can hold. If you bring in things that don’t have a home and don’t fit, either remove older things or move the new items to another room. When you have a clean and tidy bedroom, you will have a more centered mind. It will help motivate you to keep the rest of your home organized too. When you make bedroom organization a lifestyle, just start small and then make it a lifestyle you can maintain. Then, you’ll finally have the bedroom of your dreams! Do you feel like you’re on the right track to getting your bedroom organized, but want even more home organization information? We got tips for every room in your home. Bedroom Organization: Your Complete Guide – This guide is everything you need to know including step-by-step bedroom organization instructions and small space hacks. Shoe Organizer Ideas: Practical Ways to Organize Your Shoes – Effective shoe organizer ideas for keeping track of all your shoes. Closet Organization: Your Complete Guide – If you have ever struggled with closet organization, this guide is going to be your lifeline!